Learn and grow in the arts. 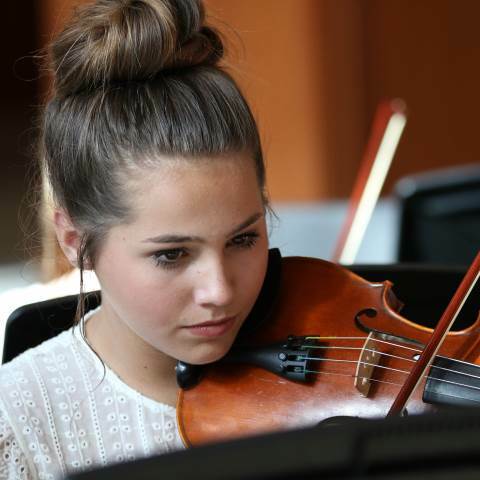 In Darlington's Upper School arts programs, you'll hone your craft and skill as you do advanced course work, prep for college and auditions, experience gallery showings, and prepare for a life filled with artistic passion and skill. Our Upper School Visual Arts Program offers five levels of Studio Art classes, each focused around your skill level and expressive medium. Experiment with advanced techniques in drawing, painting, printmaking, and pottery in our beautiful vaulted-ceiling studio. As the year progresses, you'll find yourself empowered to create your own projects, expressing yourself as you improve in the principles of art. At the Upper School, the media arts become even more of a curricular focus with courses like The Newsroom, Photographics and Advanced Media: Yearbook. In these classes, you'll continue using the Adobe Creative Suite software in addition to learning WordPress. Units in broadcast journalism, reporting, photojournalism, First Amendment implications and graphic design are embedded in the coursework, exposing you to a variety of contexts in media arts. You'll find yourself empowered to create your own projects, expressing yourself as you improve in the principles of art. Student publications include The Jabberwokk yearbook. The Darlingtonian online newspaper and The Inkslinger literary magazine. From the first echos of an in-tune version of "Itsy Bitsy Spider" to performing your senior-year aria, at Darlington you'll be encouraged to develop your vocal skills and explore a variety of musical styles and ranges. Ensemble opportunities include Ladies' and Men's Chorales, Concert Choir, and The Darlingtones and Random Notes a cappella groups. In addition to performing opportunities on and off campus, you may participate in Georgia Music Educators Association (GMEA) district and state-level activities, Georgia Independent Schools Association (GISA) choral events, and as guest choirs at university and college festivals. Woodwinds, brass, strings, percussion and beyond. If you're looking to begin or fine-tune your instrumental music skills, Darlington has an ensemble that brings skill, creativity and collaboration together in perfect harmony. Opportunities include Wind Ensemble, Stadium Band, Piano, Orchestra, String Ensemble, Guitar Ensemble, solo performance, and more with opportunities to perform both on and off campus throughout the year. Whether you're a budding instrumentalist or a college-bound musician, your life will be enriched by the power of music. Whether you're a beginning thespian or a future Broadway star, at Darlington there are so many ways to be involved in the theater program. The annual fall play and winter musical offer a variety of ways for you to lead, shine, and build confidence. Step into the spotlight. Perform the score. Imagine and create the set and costumes. Transform a look as a makeup artist. Learn the tech through lights and sound. Or help direct an entire production. Whatever role you play, you'll find a creative venue for self-expression, learn the value of collaboration and teamwork, and have fun while doing it. Expand on your skills and prepare for competitive auditions with personalized one-on-one instruction and challenging performance opportunities. Stacy Chen ('18), a day student from Rome, Ga., talks about her experiences in the theater program as she learned new ways to express herself and tap into her creativity.